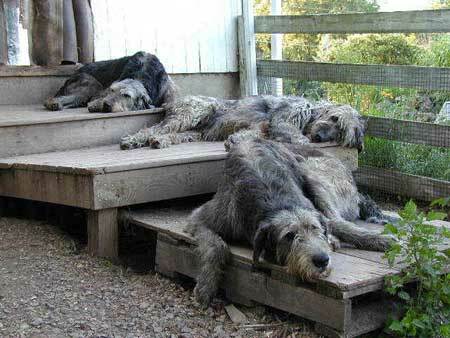 As the tallest of breeds the Irish Wolfhound is also one of the world’s gentlest dogs. Great with children, loyal to its family, and needing lots of TLC in return. Their size may be the only thing to discourage unwanted visitors because it will welcome all visitors. Train and handle in a firm manner. 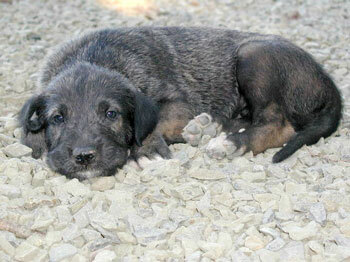 If you get a Wolfhound puppy just remember how large it will get, quickly. A full grown male Wolfhound can grow to 3 feet at the shoulders and 150 pounds. This is a rural dog wanting plenty of room to run and play. Brush on at least a weekly basis. Medium length, rough Moderate Not for apartment. Likes large open area to roam. Short life span.